Follow Jesus through the last day of his life in Luke's Gospel, discovering how that day transforms your every day. What difference does the cross of Jesus Christ make to the way you live? It's easy to know that Jesus' death has changed your eternal life completely, and yet still be missing something important when you think about the cross. The New Testament teaches that Jesus’ death is not only great for the future, when we die; it changes how we live today, too. The events of Christ’s final day can transform our every day, shaping every detail of our lives: suffering, success, money, marriage, everything. This six-study Good Book Guide looks at the twenty-four hours before Jesus’ death through the eyes of Luke’s Gospel. There are no wasted words, spare characters or unimportant moments. Every aspect of Jesus’ final day will change our hearts and challenge our lives. Let his Passion stir yours. "Here at Covenant Life Church, we have greatly benefitted from the small group resources from The Good Book Company. Many small groups in our family life ministry have used "Colossians: Confident Christianity" in their study of scripture. Additionally, our youth ministry has used "Romans 1-5: God and You" in their small groups. Both resources were very easy to use, helped the reader engage directly with the scriptures, and had a wonderful pastoral emphasis demonstrated in all the questions." I ordered 8 copies of this study for my home group to use in the period leading up to Easter. It has been brilliant. Very thought provoking and challenging. Fascinating and unexpected cross references, for example the cup of God's wrath! The cup our Lord asked to be taken away, yet not my will but yours be done. I can thoroughly recommend this study for Lent. We are a group of 3 ladies studying together. 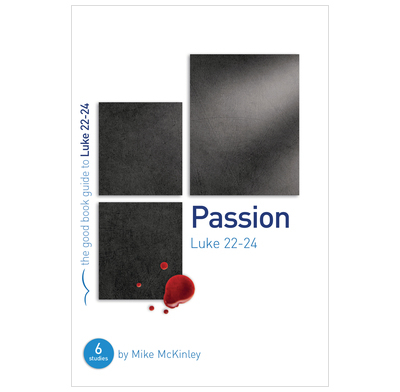 We are finding that "Passion" is challenging us to think more deeply about the days leading up to the crucifixtion. Mike McKinley writes good questions that are thought provoking but easy to understand.